Has anyone ever told you that a bird in hand is worth two in the bush? For some time now I've offered this service called Excel_Geek Blog_Mail. It was simple: sometimes people would rather read my posts in their email than visit my blog, so I started offering to email subscribers my posts manually (actually using the "Email this post to a friend" feature built into Blogger). You see, atom feeds, XML, RSS, etc., tended to be complicated for many people (me too, I'll admit it). More complicated than many readers were willing to deal with simply to get an email (or equivalent) from little old me. Over time, I've built up quite a following via Excel_Geek Blog_Mail. Some impressive loyalty, if I can compliment myself by complimenting my subscribers. Now I'm going to change everything. Excel_Geek Blog_Mail is going away. It's simply too much work for me to do every time I post. I'm sorry. I appreciate all of you dearly, but for a solid hour after each post, I'm clicking and sending. Seriously. But wait, don't leave. I'm now on Feedblitz, which I learned about through Feedburner. All you have to do to receive all of my posts automatically in your email is type your email address into the little box near the top of the left column of my blog and click the "Subscribe me!" button. Done. That's it. That's even easier than it was to sign up for Blog_Mail! But what about current Blog_Mail subscribers? Herein lies the risk. I certainly will not take the liberty with my precious subscribers' emails and sign them up for this myself without their permission. So...I'm asking you to visit my blog again (http://excelgeek.blogspot.com) and sign yourself up via Feedblitz if you want to continue to receive Excel_Geek in your email. You can see to accomplish what we need, we first repeat a space (" ") a number of times equal to the start date of the task minus the start of the timeline. Then we repeat ASCII code 219 (hold < ALT > while typing 2 then 1 then 9) a number of times equal to the end date of the task minus the start date of the task + 1. 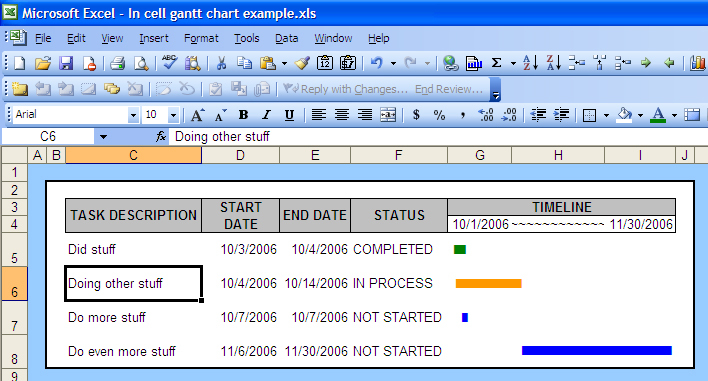 I've also done this one to use conditional formatting to color-code the bars based upon their STATUS. Pretty straightforward, I think. In order to accomplish this look, I have used in-cell charting, only this time I've aligned the "text" (the bar symbols we're using) vertically. Also, since I wanted to have the first 5 bars be green, the next 3 be gold, and the last 2 be red, I've actually split the "bars" into three stacked cells, and adjusted the height of those rows accordingly. Add to this a little standard formatting with a black background, grey border with diagonal borders drawn on the corners for a 3D effect, and you've got yourself a nice looking graphic equalizer display. The possibilities from here are endless. You could feed this display the bar values dynamically from some other application using VBA, etc. Additionally, this sort of chart could be used just as well as a regular bar chart in which you want to color-code segments. I'll be packing up these two sample files and sending them off to my Excel_Geek Insiders subscribers, so you can play around with them and get your own great ideas. 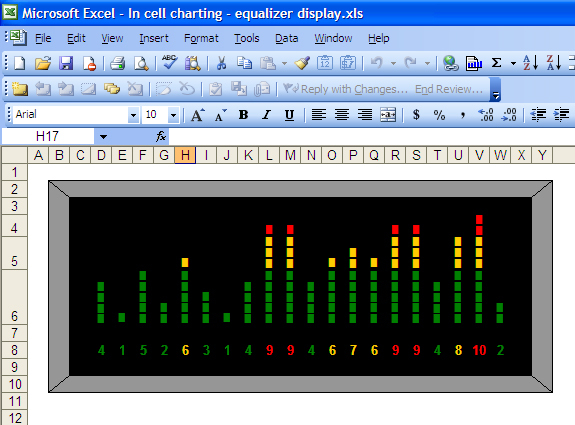 Please post a comment on this post if you come up with more cool ideas for in-cell charting.